The following missive has been submitted to the Hi-Desert Star as a Letter to the Editor. Information about how you can act now to stop this project will be made available on this site Wednesday (Dec. 5) evening. Did you know? San Bernardino County is receiving comments from the public on Dollar General’s proposal to build a new 9,100-square foot store in Joshua Tree. The comment period ends December 12, 2012. With the adoption of the 74-page Joshua Tree Community Plan in 2007, our community drew a protective line in the sand around itself in order to promote appropriate local economic development and to keep large, predatory chain retailers like Dollar General out. That line in the sand is real, and ought to be respected by County bureaucrats and giant corporations alike. That this ill-advised proposal is still alive, over a year after being proposed and despite vociferous and sustained community opposition (including a petition with 400-plus signatures from Joshua Tree residents), is testament to Dollar General’s anti-Joshua Tree attitude—and, sadly, to the San Bernardino County Planning Department’s inability to follow the laws by which it is bound. It is now time for residents and friends of Joshua Tree, including Supervisor James Ramos, to speak up once again and help terminate this wrongheaded project. 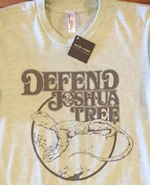 Information on how to get involved is available from the Defend Joshua Tree website. Here are some reasons why to get involved. The County’s Planning Department has generated a study now under comment (“The Recirculated Initial Study and Notice of Intent to Adopt a Mitigated Negative Declaration for ‘Joshua Tree Retail Store’”) that dramatically under-represents the negative effects that this over-large store will have on local traffic, noise pollution and visual character of our town—all of which have extra significance given that Joshua Tree functions as a gateway to a scenic National Park. The Study fails to measure the impact of the store on local business, especially in light of the incoming Super Walmart just five miles to the west. Finally, the study does not address the burden that local law enforcement will have to shoulder in responding to the inevitable shoplifting and armed robbery incidents that have accompanied Dollar General stores as they have spread westward from the East Coast. In addition to ignoring the Community Plan in evaluating the suitability of the DG proposal, County bureaucrats have made it near-impossible for concerned Joshua Tree residents to participate constructively in the DG store permitting process. The County failed (twice!) to notify all adjacent landowners of the proposal; issued notices haphazardly and incompletely, in violation of County Code and State law; and even refused to post notices or review copies at the new County building in Joshua Tree. My understanding is that each of these actions by the County will be indefensible in a court of law. Finally: On November 17, 2011, Joshua Tree residents were told by a Dollar General official at a County Informational Meeting that he would advise company higher-ups to not pursue a DG store in Joshua Tree, having witnessed firsthand that night our community’s vocal opposition. Dollar General has since continued to pursue this project as “Joshua Tree Retail Store.” Underhanded behavior like this from a would-be neighbor and community member is unacceptable—and reminds us, once again, of why we drew that line in the sand. Yes, Joshua Tree needs a general store, one that serves its residents and the tourists visiting the National Park. But Dollar General simply isn’t it. This entry was posted in Dollar General and tagged Dollar General, Joshua Tree. Bookmark the permalink. you need a young local lawyer to initialte legal actions that the tree people can keep track of in court actions — precedents, injunctions, discovery, etc. “which side are you on” type thing. Crowds show up at court dates putting pressure on local pols, merchants, media, etc.